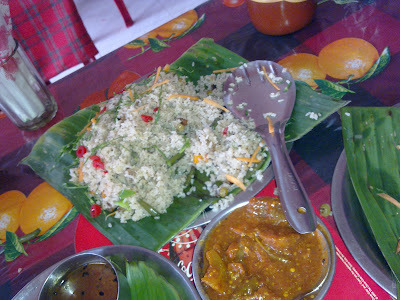 This colorful and well-presented fried rice was at a little eatery in Nagaon. Most of the time, we were too hungry at meals to take pictures, but I felt this deserved to be photographed. ok... you have to describe what you are eating here... looks delicious!!! And for someone who is clearly ignorant about Assamese food and culture - what's a Pitha? Well, we asked for fried rice. It came embellished with cherries and raisins apart from the usual carrots, beans and peas. And presented beautifully on banana leaves, with thin strips of cabbage over it. Priya Mani: Thank you! Glad you liked that piece but I don't think I'm qualified to talk about Assamese culture. 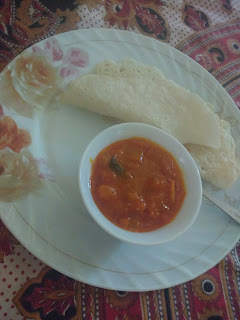 I can only talk about my experiences, which was what I did in the "pitha post". R's Mom: That rice did taste quite good. I was a bit wary when I saw the cherries, but it worked quite well.